AspEdit is a freeware airspace editor allowing to digitalize airspace. It has several features to facilitate the quick and easy import of airspace areas from various aeronautical publications. AspEdit is available for Windows only. The current version is 1.04, released march 08, 2019. See the file Version in the manual to find out what's new. 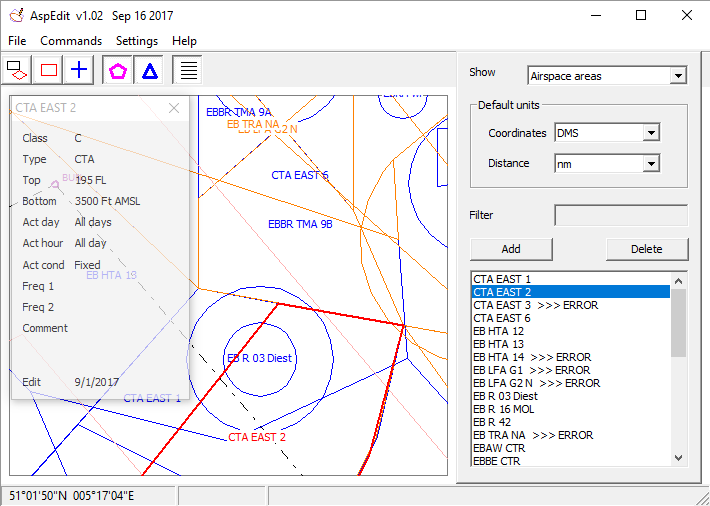 OpenAir format, for use in soaring computers and flight analysis software. The OpenAir files can be optimised for the targeted flight computer via various filters and options. Google Earth XML files. This may be useful to help visualise the airspace to novice pilots. The link "User guide" at the top of this page provides an online manual. Have a look at it to get a detailed overview of the functionality of AspEdit. An offline user guide is included in the installation package.